I've been traveling and hacking flights since 2008, spending nearly eight years researching and finding secret methods to save money, earn points, and fly for free. These effective and easy-to-use tricks have saved me thousands of dollars over the years and now they can do the same for you. If there ever was a single flight booking engine to rule them all, it would be Google Flights. This incredible website will revolutionize the way you book flights and it can save you a ton of money along the way. Let's go over some of the main features of this booking site that blows others like it out of the water. A frequent flyer knows that there are always cheaper days of the week and times of the month to fly. Google Flights simplifies your fare search by showing you a calendar with two full months of fares. There's even a handy bar graph that makes it easy to see which day is the cheapest. I have found flights for nearly half price just by using this tool and flying on the right day of the month! Sometimes you want to go to Europe, but you want to be spontaneous. You'll fly to any city as long as it's cheap. Well, Google Flights will be your new best friend. Instead of having to input a destination city, you can input a destination region (ie: Europe). You can then open a map view of the entire continent which shows airfares on every major city and airport. With this trick, I found that I could fly to Paris for $150 less than if I flew to London on the same day. Using traditional methods of flight search, you'd have to separately search each city in Europe to find the cheapest flight and this could potentially take hours. A good deal on a flight ticket is only a good deal if you're comfortable while you're in the air. Google has teamed up with Routehappy to include "Happiness Factors" in their search results. Now you can see if there is food, USB power outlets, TVs, video on demand, and Wi-Fi on your flight. 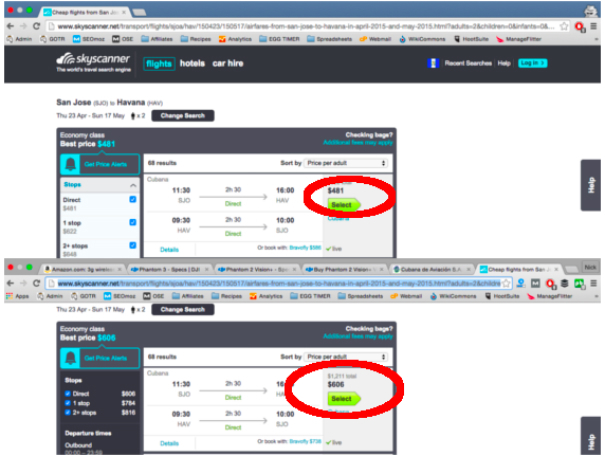 The factors are shown using easy to spot icons right next to the fares in search results. You can even see how many inches of legroom you'll have! To avoid getting charged extra every time you book a flight, simply clear your browser cache before booking anything online, or if you use Google Chrome as your browser, simply hit control-shift-N to open an "incognito" window which ensures cookie-free browsing. Note: Clearing the cache is different for every browser, here are instructions for the most common ones: Google Chrome, Internet Explorer, Firefox, and Safari. I recently booked a flight from Guatemala to Cuba and I noticed that each day before booking, the price kept going up. Luckily I utilized this simple hack and voila! The price magically went back down and I saved $250 on two tickets! Don't believe me? Check out the split image below. The bottom half is the flight before clearing the browser cache and the top half is the exact same flight, booked 10 minutes later using "incognito" mode. If you didn't know about this hack before, then you've probably overpaid for pretty much every flight you've ever taken. Next time you book a flight, make sure you clear your cache or shop "incognito." 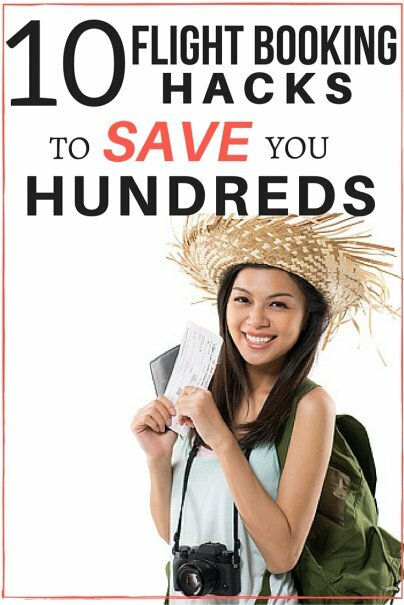 Is saving big money on flights not good enough for you? You want to fly for free? No problem. You can get free flight vouchers so you don't have to pay for your future airfare at all. It's called "getting bumped." Here's how it works: These days, there are so many people flying that airlines overbook their flights and bank on the fact that not everyone will show up to the gates come check-in time. Sometimes this works for them and they can overbook flights without a hitch, but other times they have to ask some passengers if they wouldn't mind taking the next scheduled flight instead. These passengers are "getting bumped." Why is "getting bumped" such an awesome hack? Because if you get bumped, you'll be flown to your destination on the next scheduled flight, plus you'll receive a free flight voucher for your next holiday! That's right, your next flight will be free. But you shouldn't just cross your fingers and hope to get bumped. There are three things that you should do to better your chances. The more popular the flight route, the more likely it will be that the airline needs to bump passengers. Choose a destination city that is popular, and fly on the busiest day possible (usually Monday mornings, Friday afternoons, and around holidays). Airline staff will try to choose the most convenient candidates for bump passengers. If they have to go fetch your bag from under the plane, they probably won't pick you. If you want to get bumped, try to pack only carry-on luggage. Head to the check-in counter right when it opens and have a big smile on your face. Politely mention to the agent that you're in no rush, and you'd have no problem volunteering to take the next flight if they need you to. Now you just sit and wait with your fingers crossed. This hack may not work every time, but you can definitely get a few free flights if you keep trying. The "right time to book" has been a debate amongst frequent flyers since the invention of commercial air travel. How long before your departure date should you start shopping for flights? Are last-minute deals the best or is it better to plan in advance to get early bird discounts? According to a 2013 study conducted by CheapAir.com, the optimal time to book flights is approximately 48 days (about seven weeks) before departure. The study also claimed that most airlines will charge hefty premiums for late bookings (within 14 days of departure) and for early bookings (more than five months in advance). Many flight booking engines have pretty strict flight cancellation policies that are often separate from the airline's policies. Sometimes you have to cancel your flight for unforeseen reasons and if you booked with an online booking site, you may be out of luck and out of money. Instead, find the flight using your favorite booking engine, get the flight number and date of the cheapest fare, and then go straight your chosen airline's website to book it. This way, you'll have a better chance of getting at least some kind of refund if you have to cancel down the road. Keep in mind, you can get refunds on many "non-refundable" purchases if you know how to ask. There's no reason why anyone should book travel without reaping the benefits of travel rewards and air miles from their favorite credit cards. Whenever you're paying for a holiday, trip or vacation, make sure that you're using your best travel rewards credit card. Find the best card for your travel preferences, rack up your points and miles, and then redeem them for a free vacation! If you're a loyal flyer on a particular airline, a co-branded airline card will get you extra travel perks like priority boarding and discounts off in-flight purchases. You've probably seen that little tab at the top of flight booking websites that says Flight+Hotel or Flight+Car Rental. It looks like it's just an aggressive upsell, trying to get you to spend more money than you really want to, but it turns out, there are huge savings hidden beneath that tab. Flight booking engines offer customers big discounts on their flights, hotels, and car rental if they book them all together. Even if you don't want to rent a car for the duration of your holiday, give this little hack a try. In my sample booking, the cheapest flight from Toronto to London in July of 2015 was $1,524. I then searched the same flight using the tab on the British Airways website that says "Flight+Car" and found it for just $1,444 including a rental for the duration of the one week holiday. That's $80 less for the flight, plus a free rental car. If that nasty scale at the check-in counter is calling your luggage fat, take the heaviest things out and put them in your purse or daypack. Toss some things in the laptop bag and distribute the weight into your carry-ons so that you don't have to pay an extra cent for heavy checked luggage. On most airlines, you are charged extra if you request the emergency exit seats because they have twice the leg room, but you can often get them for free. When you check in for your next flight, request that your seat is close to the nearest emergency exit row. This is free. As soon as the plane doors are sealed and you see an empty emergency exit seat, switch over to it. Because passengers are charged extra if they request exit seats before departure, there are usually a couple of empty ones available and once the plane is sealed, you don't have to pay to move into them. Basically, the Multi-City tab can be found on almost all booking sites and it gives customers access to secret discounts for taking multiple flights at the same time. In my case, I needed to fly from Guatemala City to Havana and then on to San Jose, Costa Rica three weeks later. If I were to book these flights separately, they would have cost me $938, but booking the same trip using the Multi-City tab only cost me $710. That's a savings of $218. Use this tab when you're planning multiple flights in a specific time frame and you can save a lot of money. Do you know of some money saving flight hacks that I missed? Please share them with the world in the comments below!